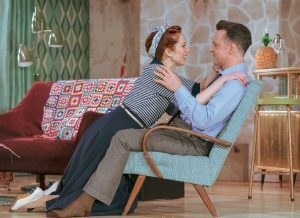 Katherine Parkinson & Richard Harrington in Home, I’m Darling. Images Manuel Harlan. 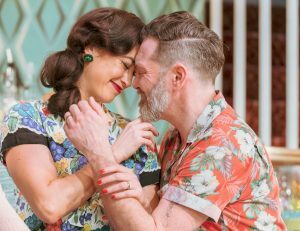 Losing your job can affect people in different ways but Judy Martin retreats into a 1950s Twilight Zone in Laura Wade’s surreal, bittersweet, comedy, Home, I’m Darling which opened this week at the Duke of York’s Theatre, in London’s West End. There was a time when a housewife was respected and revered but these days, after years of female emancipation, low wages and rising prices, they’re a rare commodity. “What do you DO all day?” asks Judy’s appalled mother, Sylvia. Judy, 38, was a lawyer until she was pretty much forced into voluntary redundancy. It’s a bitter blow for anyone but it seems to have sent Judy off the rails. 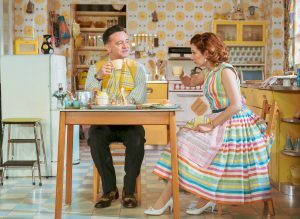 She tells her estate agent husband Johnny that she intends to take a time out from 21st century real life and, as an experiment, turn the clock back to the 1950s when women stayed at home and kept house while their lords, masters and providers went to work. In 2019 this may seem batty, especially when women have fought so long to be free of the kitchen sink but, for Judy, it’s a sanctuary. She’s been so battered by the pressures of modern life that all she wants to do is cook, clean and make cocktails. 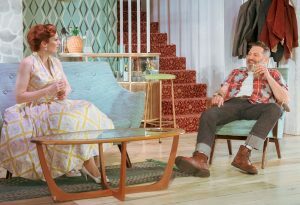 Johnny initially thinks that the whole thing is a jolly wheeze – well he would, being waited on hand and foot – but pretty soon life in the 1950s begins to suffocate both of them. 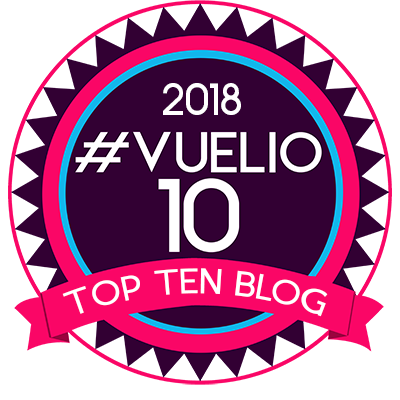 He struggles with the pressure of having to bring home the bacon while she works her way through her redundancy pay secretly rescuing the couple’s crippled finances. 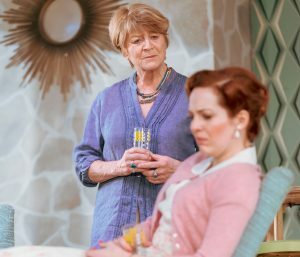 Home, I’m Darling, a co-production from Theater Clwyd and the National Theatre, proved a sell out success when it ran in the tiny Dorfman Theatre last year and it well deserves this West End transfer. 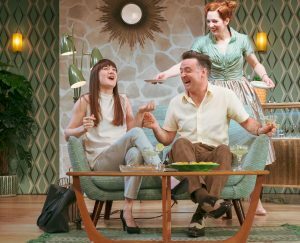 It may, superficially, be a very funny comedy, but there’s an awful lot going on in Wade’s acutely observed and intriguing play. Judy’s obsession with the 1950s knows no bounds. Her shopping is decanted into authentic vintage packaging; her vast collection of floral flare dresses are sourced online; and their home in Welwyn Garden City is a migraine of vibrant clashing geometric patterns – complete with genuine retro fridge and plastic pineapple ice bucket. 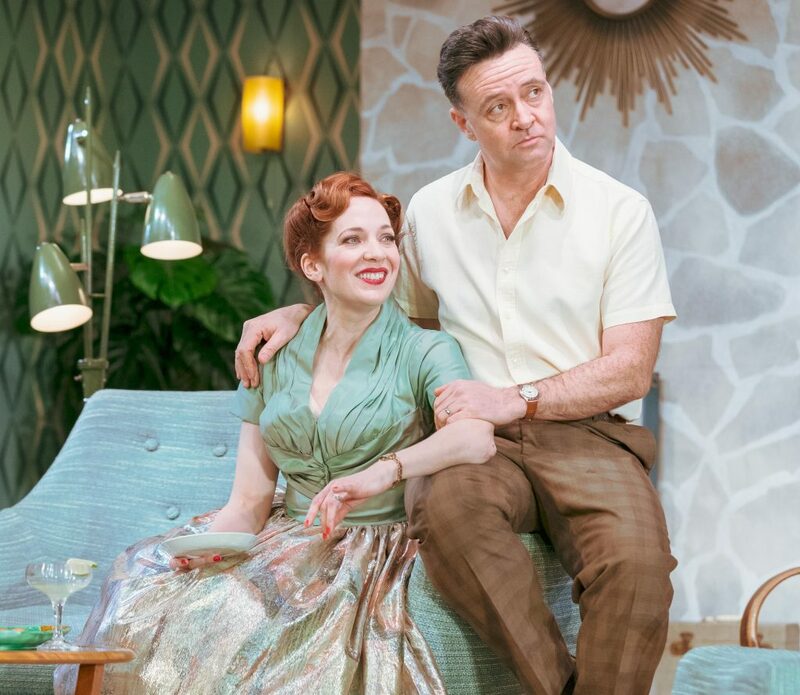 Katherine Parkinson creates a ’50s idyll to escape real life in Laura Wade’s sparking, sad, and terribly clever comedy, Home, I’m Darling.